Upshot is made by California-based "Drinks That Work Inc.". The concentrated energy shots come in three flavors; fruit, kola, and mocha - and are served in small 2.5 fluid ounce bottles. The drink is not carbonated. Upshot includes caffeine from predominantly 'natural' sources - green tea extract, kola nut extract, and guarana seed extract. (Kola flavor) Water, liquid sucrose, natural flavors, citric acid, natural gums, potassium sorbate. Proprietary Methylxanthine Blend 330mg (Caffeine, Theobromine, Theophyline, from Guarana Seed Extract, Green Tea extract, Kola Nut extract and USP caffeine anhydrous). 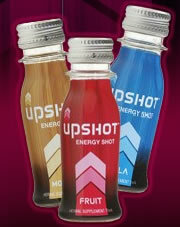 Upshot contains 80.00 mgs of caffeine per fluid ounce (270.51mg/100 ml).